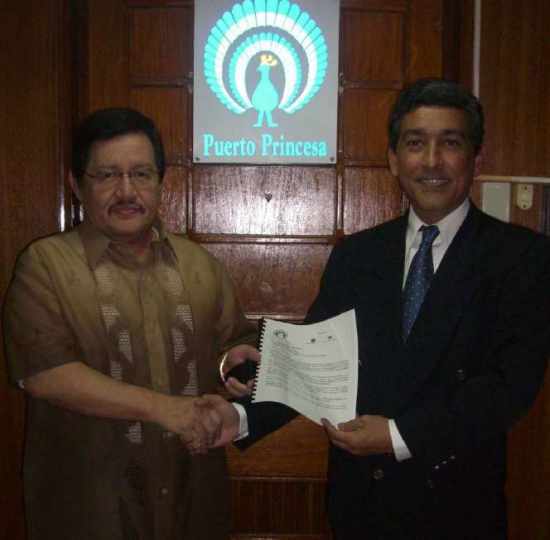 PUERTO PRINCESA CITY MAYOR Edward S. Hagedorn accepting the hosting of the 2008 FIM Asian Motocross Championships Round 1 for the Philippines from Macky Carapiet, President of the FIM Asian Motocross Commission for the biggest motorsports event to be held in the country in Puerto Princesa City on February 24, 2008. The event has over 10 countries participating with ESPN global television coverage packaged with the event and shown to over 540 million household globally. The Asian tour shall be going to Philippines, Macau, Iran, Singapore, Indonesia and Guam. Copyright 2005-2009 AsiaMx.Org. All rights reserved.